It is wise to use flours specifically formulated for various baked goods, such as bread flour or cake flour, although all-purpose flour is suitable for a majority of items. In fact, many recipes calling for wheat flour as an ingredient, suggest the use of an all-purpose flour, which is a heat processed, steel-ground blend of both soft wheat and hard wheat. A primary reason for the popularity of wheat flour is due to the degree of gluten formation that occurs when the flour is combined with liquid. Gluten provides dough with elasticity and the ability to stretch as the leavening agent produces carbon dioxide gas, which enables the dough to rise effectively. The more protein in the flour (as is the case with hard wheat flour), the more gluten is formed when the flour is mixed with liquid. However, some recipes require that baked items not rise excessively, so using flour with less gluten forming capability (soft wheat varieties) is better for this purpose. Many nonwheat flours rise very slowly or not at all so they are most often used in conjunction with wheat flour to provide the necessary gluten forming capabilities, ensuring that the dough rises properly. Baked goods with a larger proportion of nonwheat flour are much denser than baked goods prepared strictly with wheat flour. All-purpose flour is the most widely used type of wheat flour. 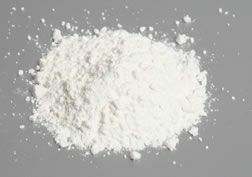 It is available as bleached or unbleached flour. 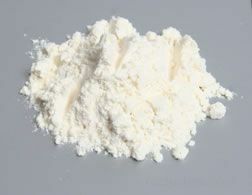 Bleaching is a process used by millers to increase the whiteness of the flour. If the flour has been bleached, the package will be labeled as such. Bread Flour is produced from hard wheat, making it high in gluten and very effective for yeast breads. Bread flour is also referred to as unbleached flour. Bromides help to strengthen the flour to achieve optimum gluten formation for bread making. 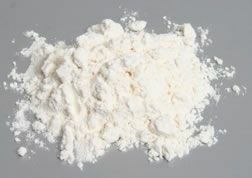 Bromated flour is rarely used in the United States because ascorbic acid is now used to strengthen wheat flour that is specifically used for bread making. Cake flour is very finely ground and is made from a low protein, soft wheat, so the flour contains less gluten. This results in lighter, less dense textures (a more tender crumb) for baked goods. 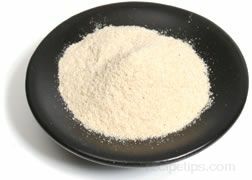 Farina is a type of flour or meal made from almost any type of grain, nut, or starchy root, but is most often made from wheat. It is usually boiled in water to create a bland tasting hot breakfast cereal or it can be used as an ingredient in other dishes. 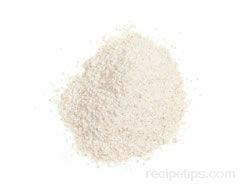 Gluten flour is a most often used in conjunction with flour varieties that are low in gluten. It is often confused with bread flour, which is fortified with additional gluten, but has a lower gluten content than gluten flour. Graham flour is a type of wheat flour that is slightly coarser than regular flour. 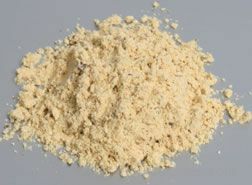 It is often confused with standard whole-wheat flour, but Graham flour contains coarsely ground flakes of bran and the wheat germ is usually removed to lengthen the shelf life. Instant flour dissolves easily in liquids regardless if the temperature of the liquid is cold or hot. 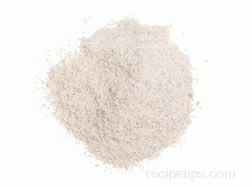 Instant flour is most often used to thicken gravies, sauces, soups, and other food items. Pastry flour is finely ground, but it is not as fine as cake flour. It is available in bleached and unbleached varieties. It is not suitable for bread making because the gluten content is too low. Self-rising flour is a type of all-purpose flour in which salt and baking powder (leavening) have been added. It can be easily prepared at home by adding 1½ teaspoons of baking powder and a ½ teaspoon of salt to 1 cup of all-purpose flour. 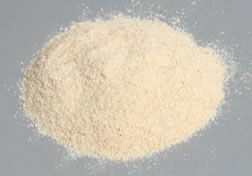 Semolina flour is a granular flour with a light yellow color. It is produced from durum wheat, which is used almost exclusively for making pasta, however bread made with semolina flour has a crispy crust and a chewy interior. 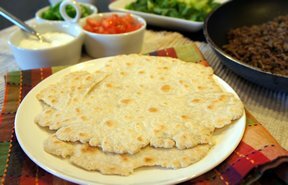 Tortilla flour is a type of hard-wheat flour that has a lower gluten content making it a good choice for various baked goods. 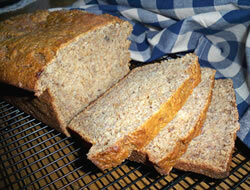 Whole-wheat flour is made from the entire kernel of wheat, which includes the bran and germ. This creates flour that is more nutritious for baked goods. Breads baked with whole-wheat flour do not rise as effectively as breads baked with all-purpose flour or bread flour, but the loaves are denser. Because of the presence of some of the bran and germ, pastry items made with whole-wheat pastry flour are more nutritious than pastries made with white pastry flour, but they are not quite as light and airy.